Giving it one more go...before we forget the parts...or lose our parts...whichever comes first! In the 1990s, Dopplegang rose to prominence as one of the area's most popular jam/rock bands. 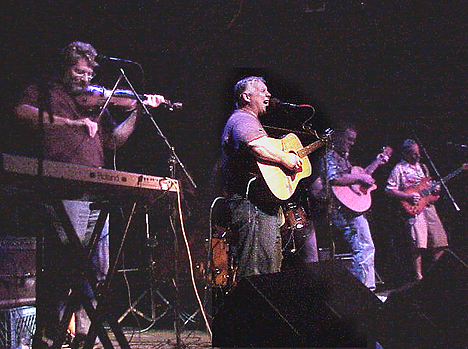 Described as a mix of Southern Rock,/Celtic Slam/Bluegrass/Folk Fusion, every original and unique cover song from this dynamic six-piece band, was stamped with the Dopplegang brand. 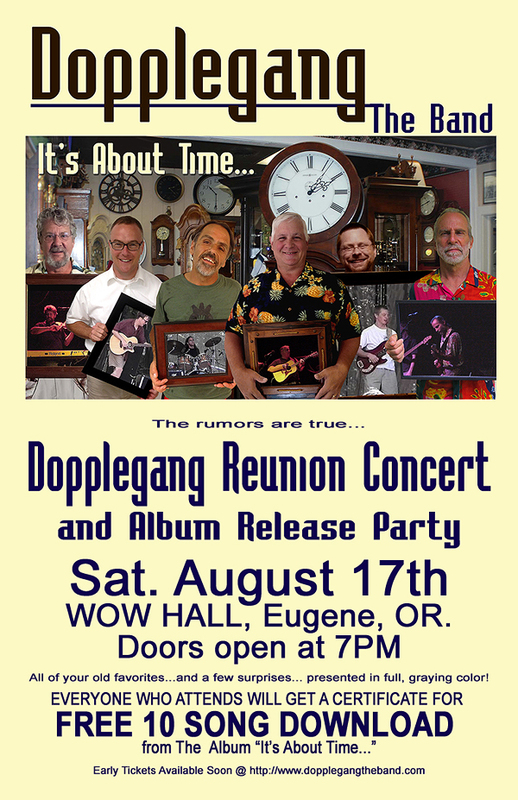 Comprised of several well-known players from a wide range of professional music backgrounds, Dopplegang is best known for its extended jams and eclectic musical styles ranging from originals to "original covers" from Little Feat, Peter Gabriel, The Grateful Dead, David Baerwald, and lesser-known gems mined from the annals of Adult Alternative formats. Dopplegang is comprised of Patric Miller (guitar, mandolin, lead vocals), Brian Price (electric fiddle), Brad Rosen (drums), Peter Bach (guitar, vocals), Jeremy Gibons (bass), and Frank Sprouse (lead guitar). The band was formed from some of the best-known bands in the area, and its members have extensive recording, performing and touring credits including an Emmy Award winning songwriter/producer (Miller), the band Old and in the Way, SpiritFarm, Eugene Hot Club (Price), Little Women and Jerry Joseph and the Jackmormans (Rosen), Nine Days Wonder, Highstreet (Bach) and countless other area bands too many to mention (Gibons and Sprouse). In September of 1993, Dopplegang played their first "big show" at the Eugene Celebration's 6th Street "Good Times" Stage. It marked the launching point of more than six years of concerts, bar gigs and festivals, before the bands members began moving away to raise families, nurture "real jobs" and bacting like the responsible adults their families needed them to be. They played a single "Reunion Show" in the Fall of 2001, at the Wild Duck, and then once again spread to points North and South to continue their lives. And now…almost 20 years to the day, of our formation, Dopplegang is getting together for a 20-Year-Reunion Concert that brings back the FULL roster of talented (if aging) players for a night of music, and memories. The show will be presented at the WOW Hall, where Dopplegang played no fewer than 15 times as both headliner and supporting act (for a long list of luminaries). ALBUM RELEASE In the active 6 years that Dopplegang played in countless festivals including The Oregon Country Fair (3), Eugene Celebration (5), Art in the Vineyard (4), Willamette Blues and Brews Festival (3) Oregon Folk Festival (3), Bend Lava Festival, and countless clubs, special events, and weddings, the band never completed a full album of their originals and unique cover tunes. This is about to change. ALBUM RELEASE PARTY on SAME NIGHT As part of Dopplegang's efforts to remember their own music, they set about FINALLY recording their most popular songs for posterity. Click Here to reach the download page.